This Election Day Exit Poll highlighted the issues and policy priorities Black women voters are most concerned about. The media briefing also included an intergenerational Black women’s leadership discussion that provided a deeper analysis. This Election Day Exit Poll highlighted the issues and policy priorities Black women voters are most concerned about. 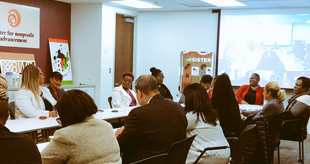 The media briefing also included an intergenerational Black women’s leadership discussion that provided a deeper analysis of the impact the Black women’s vote had in 2018 Mid-Term Election Cycle. The Black Youth Vote! Black Male Initiative is a program designed to provide a platform to encourage civic engagement between inter-generational groups of black men and boys. The signature event of this initiative is the annual Gathering of Black men and boys on Capitol Hill. Black Youth Vote! (BYV!) is a national grassroots coalition of organizations and individuals committed to increasing political and civic engagement among black youth and young adults between the ages of 18-35. On April 4, 1996, BYV! was launched under the theme “The Ballot, Not the Bullet” live on CSPAN to address the chronic decline in Black youth voter participation. 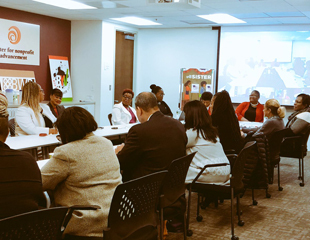 The National Coalition Black Women’s Roundtable promotes public policies that ensure stable families and a prepared workforce for today and tomorrow. 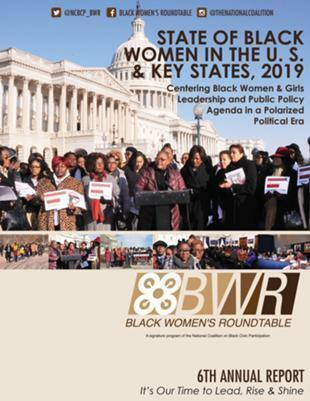 BWR believes that there must be intentional efforts, including program development, funding, staffing, administrative practice and rule of law to ensure genuine equity -- especially for women, communities of color, low income communities and others that have been traditionally left out of the policymaking arena. Click here to read the full statement. The Black Women’s Roundtable (BWR) is an intergenerational civic engagement network of the National Coalition on Black Civic Participation. At the forefront of championing just and equitable public policy on behalf of Black women, BWR promotes their health and wellness, economic security, education and global empowerment as key elements for success. Melanie L. Campbell is the president and CEO of the National Coalition on Black Civic Participation and Convener of the Black Women’s Roundtable Intergenerational Public Policy Network. Ms. Campbell has served in the civil rights, social justice, youth and women’s rights movement for over 20 years. Centering black women & girls leadership and public policy agenda in a polarized political era. 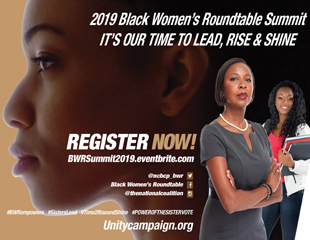 Black Women’s Roundtable (BWR) Intergenerational Public Policy Network will celebrate Women’s History Month by hosting its 8th Annual Women of Power National Summit (BWR Summit ’19) from March 14 - 19, 2019 at the Renaissance Washington DC Downtown Hotel. National Coalition on Black Civic Participation | 1666 K Street, NW, 4th Floor - Suite #440, Washington, DC 20006, USA.